Harbour boat trips are offered by several companies, one of the oldest being Barkassen-Meyer. Its tour will take you past floating docks and container terminals, while the captain will entertain you with dry-humoured jokes and informative narratives. He explains the workings of the port and takes you all the way to the Speicherstadt – Hamburg’s historic warehouse district which is the first UNESCO world heritage in the city. Behind the façades of the historic red-brick buildings you will not only find long-established carpet dealers, but also interactive museums such as the Miniatur Wunderland with its impressive model railway landscape, a spice museum, as well as advertising agencies and photo studios. From the Speicherstadt, why not stroll along the Baumwall flood protection wall designed by star architect Zaha Hadid and pass by the mooring museum ships, Cap San Diego and Rickmer Rickmers. At the St Pauli Landungsbrücken, tourists can enjoy accordion players, souvenir shops, small newsstands and food stalls. Speaking of food: arguably the best fish rolls can be found at Brücke 10. From here, you can take the stairs leading up to the international youth hostel “Am Stintfang” with its forecourt that gives you an amazing panoramic view of the port at sunset. In the summer months, Hamburg’s beach clubs on the Elbe will open again – the ideal place to dig your feet into the sand, relax and watch the passing ships and seagulls. Whether it is the elegant Piano Beach at the exclusive Indochine Club, the laid-back Strand Pauli or the family-friendly beach club 28° in Wedel – nearly all of them provide a Caribbean flair and an unobstructed view of the Elbe. From the St Pauli Landungsbrücken you can board a HVV ferry using a simple public transport ticket. For little money you can take a trip past the historic St Pauli Fischmarkt and enjoy a panoramic view of St Pauli. You can visit the former fishing village of Finkenwerder, which is located south of the Elbe, and then go on to Oevelgönne with its museum harbour and its much-loved Elbe beach. In the summer months, the beach is a popular destination for swimmers and sun bathers alike. For Hamburg’s locals, a beer shandy or a glass of Aperol Spritz from the beach café “Strandperle” rounds off the perfect summer evening. Day guests who are lacking the time for a full tour through the port should make sure to at least go on an trip with the U3 underground line. Between the stops of Rödingsmarkt and St Pauli, the U3 goes over ground along the Elbe. Even locals are blown away with what is arguably Hamburg’s most beautiful stretch of local public transport route. Well worth experiencing, especially during twilight! Back overground and further down the Elbe, a fish market is held every Sunday morning on the St Pauli Fischmarkt square. From 5am to 9.30am (from 7am during the winter months), local vendors offer not only fish, but also vegetables, meats and Hamburg- themed bric-à-brac. Whenever the Elbe floods, this historic square also floods – funnily enough, it has never done so on a Sunday. It seems that Hamburg has a good relationship with the water – at least most of the time. Combining maritime flair and architectural scenery, the Hafencity district is situated on a former port site. This new quarter of town is interspersed with waterways, and its promenades provide a view of architectural highlights such as the Marco Polo Tower, the Unilever-Haus and the Spiegel building. At the Tall Ship Harbour, visitors can experience Harrys Hafenbasar, a permanent exhibition of bizarre maritime souvenirs from colonial times located in a historic floating crane. At the Hamburg Cruise Center HafenCity, you can watch the most recent international cruise ship arrivals close up. Starting from the Jungfernstieg, the Alster ferries take you on a tranquil tour across the Outer Alster Lake. For the more adventurous type, we can recommend a trip through the canals of the Alster – the habitat of the moorhen. Its extensive branches can be explored on an excursion boat or rented paddle boat. And there is yet another option, but certainly not for the faint-hearted: you can rent a surfboard and give stand-up paddling a try – paddling by weeping willows and white Gründerzeit façades all the way up to the Stadtparksee in the north of the city. Stretching from the source of the Alster to the River Elbe, the "Alsterwanderweg" offers hikers and cyclists an enchanting natural landscape interspersed with picturesque locks. Along this route, the Alster is still a small, quiet river meandering through moors and small forests. The Alsterwanderweg is one continuous route and is part of the north German “Via Baltica” pilgrim route. The most beautiful stretch of the Alsterwanderweg can be found between the suburban railway stations of Alsterdorf and Hamburg-Ohlsdorf. On the far side of the Elbe, just opposite the St Pauli Landungsbrücken, you will find the musical theatres staging “König der Löwen” (Lion King) and “Das Wunder von Bern” (The Miracle of Bern). How do you get there? By boat of course – the Hamburg way. From the top deck of the ferry you can enjoy the spectacular view of the glittering façade of the Elbphilharmonie, Hamburg’s new concert hall, and the HafenCity, Hamburg’s new quarter on the Elbe. Guests to the musicals can also enjoy the cityscape of Hamburg during the intermissions. 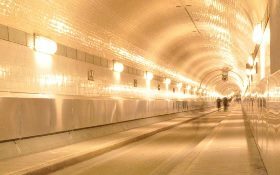 Not so much a view, but an experience in its own right: a stroll through the Old Elbe Tunnel, which was opened in 1911. A lift takes you down to the cool depth of this historic building structure, where two white-tiled tubes lead you underneath the Elbe to the other side. You can either walk or cycle, while the River Elbe rages a good 20 metres above your head. Also worthwhile experiencing: rattle down to the tunnel in the car lift.